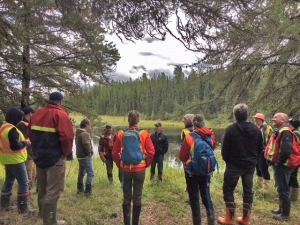 In late August, representatives from Ducks Unlimited Canada (DUC) travelled to Whitecourt to deliver wetlands training to Millar Western’s woodlands team, fulfilling one of the commitments under a recently signed memorandum of understanding (MOU) to form a Boreal Wetland Stewardship Partnership. Under the MOU, DUC and Millar Western are committed to working together on several projects to ensure effective stewardship of wetland and waterfowl resources within the Millar Western Forest Management Area (FMA), located in Alberta’s commercial forest. The classroom and field components of the training provided the woodlands team with an opportunity to not only strengthen their knowledge of wetlands but to also learn specifically about the types and distribution of wetlands in Millar Western’s Forest Management Agreement (FMA) area and their role in the region’s forest ecology. DUC also shared insights into new research about the functionality of wetlands and impacts related to disturbances and climate change. 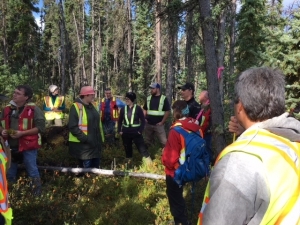 The knowledge gained will help Millar Western to conserve these important forest features on the landscape and meet evolving regulatory and certification commitments regarding hydrology and wetlands. Millar Western and DUC are also members of the landmark Forest Management Wetland Stewardship Initiative (FMWSI) A partnership between DUC and the forest products industry, FMWSI is a visionary approach to advancing sustainable forest management and wetland stewardship in the boreal forest. FMWSI will deliver other technical support materials to participants, including a decision-making tool for assessing and mitigating the risk of incidental take of waterfowl nests, which is expected to be released later this fall. 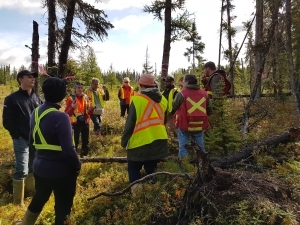 With wetlands training, BMPs, and additional support material through FMWSI, Millar Western’s team will be better equipped to make more informed decisions when working in and around wetlands.